Lift-and-slide’s basic structure without any external architectural treatment. HERCULES Carparking Systems provides mechanised car-parking solutions that range from two car double stacking systems for residential use to multi-level, lift-and-slide car parks for commercial car parking operations. Hercules has noticed an increased interest from architects looking to maximise the number of available car spaces in unusually configured developments or those with very tight floor space ratios. Being involved at the design phase of a project allows Hercules to work with the architect to maximise the car storage potential of the building. One of Hercules’ solutions that is rapidly gaining acceptance is the lift-and-slide car stacker. These units can be installed in basement car parks or alternatively they can also be stand-alone outdoor structures. Because the units are load-bearing structures, the architect is not restricted in the type of external finish that can be specified. The lift-and-slide stacker provides independent parking where any car can be removed without having to depend on another car being removed. There is no limit to the number of cars parked side by side and there is always one lower space vacant. To retrieve an upper car the lower cars automatically slide to one side to allow the upper car to be lowered to the ground. Units up to six levels high and 10 cars wide can be constructed. 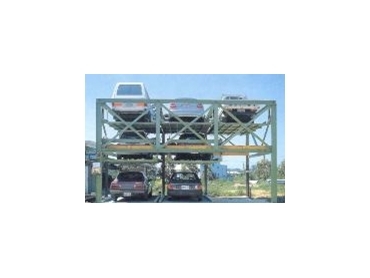 The units are modular, therefore there is no limit to the number of cars that can be stored. The stackers electro-mechanical and thus cheap to operate, with very low maintenance.